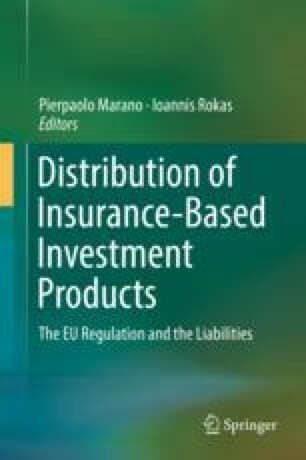 This chapter aims to analyze the historical perspective of the substantial rules on the regulation of Insurance-Based Investment Products (IBIPs), the IDD in relation to all insurance products as well as in relation to all additional rules on IBIPs. In doing so, it aims to offer a critical reasoning and analysis of the rationale behind the special topics in relation to IBIPs i.e. conduct, remuneration and conflicts of interest. In relation to the above it also analyses the evolution occurred to date in the financial services. Further on, it discusses the new regulations from the financial services perspective and attempts an analysis of their impact after the latest evolutions at European Commission level II delegated regulation. Both authors have elaborated the paper. Nevertheless, Sects. 1 and 2 can be attributed to Kyriaki Noussia and Sects. 3 to 7 to Michele Siri, while Sect. 8 was jointly drafted.